We’re walking across a small clearing, some three hundred yards or so of open ground that dips into a ravine and then rises back up before dropping more than a hundred steep feet to the Potomac River. There’s a cemetery on the far rise just before the big drop. This is Ball’s Bluff, and Morgan is the man who literally wrote the book on the battle: A Little Short of Boats: The Civil War Battles of Ball’s Bluff and Edwards Ferry, October 21 – 22, 1861, published by Savas Beatie. “Sometimes you stumble across something and you find your niche, and this is mine,” Morgan says. Morgan, 63, a librarian for the U.S. Department of State by profession and battlefield guide by avocation, first discovered Ball’s Bluff in 2000. At the time, the town of Leesburg and the Northern Virginia Regional Parks Authority (NVRPA) acquired 141 acres of land adjacent to the small plot already set aside for the battlefield and the Ball’s Bluff National Cemetery. The battle itself, though, which took place October 21, 1861, had largely been forgotten. NVRPA wanted to change that. After they acquired the land, the authority decided to start up a guide service to offer regular interpretation of the site. Morgan was among those who responded to the call for volunteers. He stops along the gravel causeway that crosses the clearing and looks at the ground, nodding. “I literally just stumbled into it, and one thing lead to another,” he says, “and I really have come to love this little place. Morgan fishes for a quote from Union commander Charles Stone, writing to historian Benson Lossing. “He said, ‘Ball’s Bluff was like an unnoticed morning skirmish on the Petersburg’s lines.’ And it’s true. It’s true. At Petersburg, those guys were slamming into each other every single day, several times a day, in groups of this size, fighting for a few hours,” Morgan says. As Morgan got more involved with the guide service and better versed with the story, he felt something start nagging at him. Basically, he says, the story of the Battle of Ball’s Bluff had been told as a bungled attempt to implement an existing plan to take Leesburg. “Well, years later, forty years after the war, he writes what is really the first lengthy account of the battle. There had been some newspaper articles, solider memoirs, but he wrote was really…kind of a booklet. And what he did, forty years after the fact, was get a lot of stuff wrong because he was reading the then-very-new ORs, and a lot of the stuff in the ORs is wrong. And of course White had been through the war, and he still believed that idea that this had been a pre-planned attempt by the Yanks to take Leesburg, partly because people were expecting something like that to happen. They had lost Bull Run. McClellan comes in and ‘On to Richmond.’ Everyone on the Southern side, they can read the Northern newspapers and see how much pressure is being put on McClellan to do something. He’s been in command a couple weeks, so do something, do something. Once he started digging and really became convinced that the story was being told incorrectly, he says he went back and took a second look at a lot of the research to clarify for himself the problems with the story as he saw it. He didn’t set out to write a book, although is work eventually evolved into a book project at the urging of several friends and fellow guides. The first edition of the book came out in 2004, but almost immediately, Morgan began to collect new information on the battle, and he eventually realized he needed to update the book. Because Ironclad doesn’t publish hardcovers—and Morgan wanted the updated edition to be hardcover—Wittenberg released the rights so Morgan could approach Savas Beatie, which released the updated volume in July. Morgan says he’s been gratified by the response to the book thus far (Emerging Civil War will offer its own positive review later this week). But he’s been even more gratified by the attention the battlefield has been getting. “It has, for so long, been obscure because it is so small,” he says. Having the opportunity of the sesquicentennial following so close after all the effort we’ve made over the past few years, the guide service, my book, the new signs, the new trails that have been cut in—we want to bring Ball’s Bluff to people’s attention in a way it hasn’t been before. Join us in a few days for more of our conversation with Jim Morgan as he shares some of his insights on the Battle of Ball’s Bluff. He’ll also give us a behind-the-scenes look at how the battlefield was preserved and developed, and he’ll take us inside Ball’s Bluff National Cemetery. 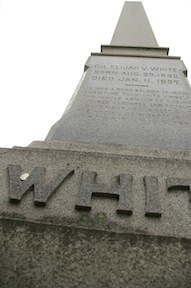 This entry was posted in Battlefields & Historic Places, Battles, Books & Authors, Memory and tagged A Little Short on Boats, Ball's Bluff, Ball's-Bluff-series, Elija White, James Morgan. Bookmark the permalink. I will be proudly reenacting at Ball’s Bluff on the 150th anniversary of the battle with the 15th MVI. It’s actually the day after the anniversary since the reenactment is on October 20th. Anyone who is close by should come a visit the battlefield and the reenactors. We will actually have POWs after the battle which is scheduled to be from 2 to 3. Good luck with the reenactment, Paul! One correction to what Mr. LaCroix wrote: the date of the reenactment is Saturday, October 22. The anniversary is the 21st but these things are best done on weekends so the reenactment will actually be 150 years and one day after the battle. Ball’s Bluff has never before been reenacted on the actual battlefield and very likely will never be again. Check out http://www.150thballsbluff.com for more information. Having seen some of the work first-hand, I was really impressed with the preparations that have gone into getting the battlefield ready for the event. If you haven’t visited Ball’s Bluff Battlefield, do so. 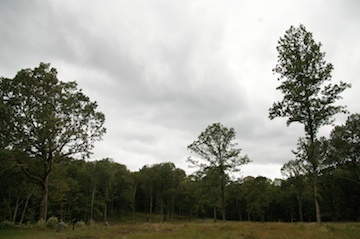 This field has “feel” like few others–especially if you are alone or with a small group. Bring Jim’s book and guide. If you come about the time of the re-enactment, you will see what the soldiers saw as they died–gorgeous foliage. But standing in the small National Cemetery, with all but one grave (that of James Allen of Northbridge, Mass.) marked “UNKNOWN,” you will have a very different feeling. Thanks go to Jim Morgan for his book, this interview, and his recent article in the Civil War Trust’s magazine HALLOWED GROUND. We have more on Ball’s Bluff and Jim’s book coming up, Richard, so be on the lookout. 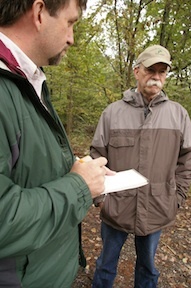 As a new guide at Ball’s Bluff, I’ve been inspired by Jim and greatly enriched by his knowledge and willingness to share it while on walks around the site.